In Petroglyphs Provincial Park, Vancouver Island, Canada, rock art is generally divided into two categories. Pictographs are painted onto rocks using a variety of natural colors such as red, brown, white or yellow, depending on plants or minerals found locally. Although the majority of the images were drawn with the finger, some were executed with brushes made of animal or plant fibers. Petroglyphs are images that are scored, scraped or ground into cliff walls, boulders and flat bedrock surfaces by using stone tools. Pictographs and petroglyphs may constitute Canada’s oldest and most widespread artistic tradition and rock art sites have been discovered throughout Canada. No infallible method for the dating of rock art has been discovered, other than their association with other relatively datable archaeological remains. The tradition of rock art is thought to have been brought into Canada by its earliest occupants during the last ice age. Hundreds of pictograph sites and a few petroglyph sites have been discovered within the Canadian Shield which is the 3 million square mile (8 million square km) area of Precambrian igneous and metamorphic rocks that forms the ancient geological core of the North American continent. Some of the art has been discovered beneath many layers of archaeological deposit, such as the muddy areas of lakes in wooded areas, which have been dated to before 5000 years ago, making them the oldest in Canada. Petroglyphs Provincial Park, which covers two hectares, is located just south of Nanaimo on southern Vancouver Island. A short walkway leads from the parking lot to an interpretive area with information boards and a display of replica casts taken from the park’s petroglyphs. The sandstone gallery of the originals is just a short walk to the hill that overlooks the harbor. In 1984, a specially designed construction was built over the main body of the petroglyphs. This glass enclosure protects the images from the effects of acid rain, algae, frost, and vandals. In 2002, a visitor center opened and it features some native beliefs and their thoughts on the petroglyphs. There is also a section showing other rock art sites in the world. The park was established in 1948 to protect these cultural relics while affording us the opportunity to travel back a thousand years or more, to a time before Europeans explored the shores of Canada. 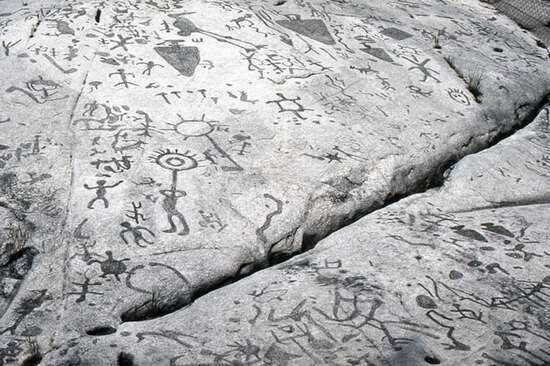 Unfortunately, petroglyphs are becoming a thing of the past due to both man and nature. Petroglyph Provincial Park has the largest known concentration of indigenous petroglyphs in Canada, depicting mythological sea creatures, turtles, snakes, birds, humans as well as symbols and wolves; this sacred site is known as ‘the teaching rocks’ by those who have inhabited the area for more than 5000 years. Rock paintings and carvings were made for a variety of reasons, including territorial ownership and to commemorate special events among a people with no written language. The images were skillfully outlined in the sandstone surface of the rock by them. Locations for rock carvings were chosen with care, and were almost always made at places of power or mystery – places where the spirits of nature were believed to gather, such as waterfalls, rock formations or caves. As Petroglyph Provincial Park is a place of dreams for the Snuneymuxw First Nations, and was a spiritual refuge, this may be the reason these etchings are richly concentrated in the area. Rock art in much of Canada is linked with the search for benevolent spirits and with shamanism – a religious tradition in which the shaman’s major tasks are healing and prophesy, along with the vision quest. Nearly all rock art sites are near water and may also be near old villages or along trails or ancient trade routes. The Peterborough petroglyph within the Petroglyph Provincial Park is the most incredible specimen in all of Canada, containing several hundred images carved onto a single rock outcrop of crystalline limestone. There are no pictorial boundaries and no deliberate grouping of images. Aesthetic order is in harmony with nature, and images are often integrated with the numerous depressions, cracks and fissures of the rock itself. The carvings are thought to date from 600 to 1,100 years ago and the petroglyphs form the largest known single concentration of rock art in Canada. The shape is rectangular and the gently sloping surface is roughly 196 by 115 feet. Thirty-one hammerstones made of gneiss (hard rocks formed by the metamorphosis of granite) were found in crevices nearby. For nature lovers there is a wide diversity of trees and plant life, including red and white pine with pockets of spruce and other trees such as white birch, sugar maple, and red oak. The park is home to a large population of white-tailed deer, as well as smaller mammals and bird life is abundant. Bald and golden eagles can occasionally be seen in the winter. McGinnis Lake with its bright blue-green water, one of only a few meromictic (layers of water that don’t intermix) lakes in Canada, is nearby. Sticking to the designated paths through the nature trails is requested of all visitors to ensure the cultural significance and vegetation of the park and its rock carvings are not destroyed. Unfortunately, graffiti has occurred in some areas by those who do not respect the worth of these ancient sites. 2013. Snuneymuxw History. Snuneymuxw First Nation.